Social Security is the nation’s most effective anti-poverty program. In contrast to the theoretical poverty-level income of the elderly when Social Security is disregarded, the actual poverty rate among the elderly in 2006 was 9.4%.10 The program lifts 13 million seniors above the poverty line. About one-third of the elderly receive 90% or more of their income from Social Security; two-thirds receive half or more of their income from the program. Without Social Security, 55% of the disabled and their families would live in poverty. The program lifts 1 million children out of poverty. The benefits are particularly important to women and minorities. Social Security provides 90% or more of the income of almost half of all unmarried (including widowed, divorced, and never-married) women, aged 65 and older, as well as almost half of all African Americans aged 65 and older. Social Security is the sole source of income for four out of 10 African Americans and four out of 10 Hispanic Americans aged 65 and older. In addition to retirement benefits, Social Security is the primary source of life insurance and disability insurance protection for workers and their families. In this way too, Social Security has transformed the world. The provision of these benefits has alleviated workers’ fears of leaving themselves and their families destitute in the event of disability. Moreover, a worker’s death no longer causes dependents to fall into poverty. Indeed, the present value12 of all of Social Security survivors’ protection exceeds the present value of all private-sector life insurance policies combined, issued in this country. A 30-year-old worker earning around $30,000, for example, holds Social Security life insurance protection for his wife and two young children with a present value of over $443,000. Social Security’s disability protection is, perhaps, even more important than its life insurance protection, because long-term disability insurance is a rare private sector benefit. Seventy percent of the private sector workforce is without it. That same 30-year-old worker earning around $30,000 has Social Security disability insurance protection, for himself and his family, with a present value of over $414,000. Benefits for the dependent children of disabled, deceased, and retired workers have made Social Security the nation’s largest children’s program, both in numbers of beneficiaries and size of benefits, an aspect of Social Security particularly valuable to minorities whose health status and work environments are often poorer than that of white Americans. Thus, more than one-third of the children receiving benefits as dependents of deceased or disabled workers are African American or Hispanic. Perhaps most fundamentally, Social Security is available to every American when it is needed most. Virtually every child who lost a parent on September 11 will receive a Social Security check until his or her late teens, because of the work effort of the parent who died. Social Security was among the first insurers on the scene immediately after the terrorist attack. The first checks were mailed on October 3, 2001—just three weeks after the attack. The program is currently paying monthly benefits to over 2,350 children and over 850 spouses of victims of the September 11 terrorist attack. Similarly, in the immediate aftermath of Hurricane Katrina, Social Security representatives were on-site at evacuation centers, the Houston Astrodome, and elsewhere to ensure that people who no longer had homes and banks could nevertheless receive on-time payment of their benefits. Moreover, America’s soldiers fighting in Iraq and Afghanistan are covered by Social Security. Disabled members of the armed services and their dependents receive benefits. Families of fallen soldiers receive benefits, as well. Like virtually all Americans, members of the armed forces depend on Social Security as the foundation of their economic security. Additional benefits provided through the Department of Defense and the Veterans’ Administration supplement Social Security’s floor of support. Altogether, 9.4 million military veterans receive Social Security—or almost one out of every four adult Social Security beneficiaries. The worker-to-beneficiary ratio, which compares the number of workers contributing to Social Security to the number of people drawing Social Security benefits, reveals virtually nothing about the affordability of Social Security, because it sheds no light on how productive those workers are or on whether other burdens on those workers are increasing or decreasing.14 The projected reduction in the ratio from 3-to-1 to 2-to-1, which results from the aging of the population, merely indicates that, if Social Security were to be funded solely—which it now is not15 —from a tax on wages, that tax would have to increase. The shift in the ratio demonstrates, in a rough way, that Social Security will cost more in the future, but it is silent with respect to the affordability of those higher costs, and, even more important, fails to reveal that those higher costs were addressed decades ago, as discussed below. A better measure of Social Security’s cost and affordability is the percentage of gross domestic product (GDP) the program consumes. Unlike dependency ratio measures,16 which simply reflect age distributions, and when more refined, work status, GDP focuses on the productivity of the nation as a whole. When the cost of Social Security is examined in terms of GDP, it becomes unquestionably obvious that our economy can support our elderly, the widespread demographic anxiety notwithstanding. While the program is clearly affordable, as the percentage of GDP illustrates, Social Security’s actuaries have nevertheless projected that, under current law, Social Security’s income over the program’s 75-year valuation period will fall short of expenditures. It is important to be clear that this deficit, first projected in 1989, is not the result of either the retirement of the baby boom or the increasing longevity of the population. As just discussed and as detailed below, the retirement of the baby boom is not only affordable, it has been fully taken into account. The reason for the shortfall of income in comparison to expenditures has more complicated and nuanced causes—ones not as susceptible, as the worker-to-beneficiary ratio, to a sound bite in a political speech. The baby boom and the increasing life expectancies of all Americans did not suddenly catch Social Security surprised and unprepared. Congress has enacted 10 significant Social Security bills since 1950. Every enactment has taken into account the baby boom, and each has left the program in long-run actuarial balance.18 The most recent enactment, the Social Security Amendments of 1983,19 put the program into slight surplus for the 75-year valuation period from 1983 to 2057. By 2057, the youngest baby boom cohort, born in 1964, would be 93 years old. The usual popular explanation of the present deficit has been to repeat the underlying reason why the Social Security system will be more expensive in the future than it is today. It is pointed out correctly that while today there are 3.3 active workers paying into the system for every beneficiary now drawing benefits, over time this ratio will change to two workers per beneficiary and in the long run to perhaps 1.9 or 1.8. This is the main reason why Social Security will be more expensive in the future than it is today. The above explanation of the current deficit—“an accumulation of relatively small annual changes in the actuarial assumptions and in the method of making the estimates”—provides the technical reasons that the official projections changed from a slight projected surplus in the 1983 report to a projected imbalance, first appearing in the 1989 report.22 Several trends, not explicitly mentioned in the annual Trustees’ Reports but nevertheless taken into account in the actuaries’ projections, have resulted in a reduction in Social Security’s income in recent years. First, most fringe benefits (e.g., employer-provided health insurance, pensions) escape Social Security taxation. Starting in the 1940s, fringe benefits have grown rapidly as a proportion of total compensation (fringes plus cash compensation), resulting in a substantially smaller Social Security tax base than would otherwise have been the case. Further, as incomes have become more unequal over the past few decades, an increasingly larger proportion of the wages of the highest income employees have escaped Social Security taxation. Approximately 163 million workers contribute 6.2% of their wages up to the maximum taxable wage base ($97,500 in 2007) to Social Security in exchange for the promise of benefits in the event of disability, death, or old age. An equal amount is matched by their employers. For the vast majority of workers, 94%, the Social Security contributions are withheld from earnings each payday throughout the year. For the highest-paid 6% of the workforce, however, the contributions are only withheld from paychecks until the worker’s earnings exceed the amount of the maximum taxable wage base. For those workers, when the maximum is reached, withholding ceases and take-home pay increases for the remainder of the year, however long that may be. In 1977, Congress adjusted the maximum so that 90% of all earnings of all workers taken together would be below the maximum; only 10% would be above. Congress sought to make the 90% mark permanent, without need for further legislation, by having the maximum increase every year automatically by the percentage rise in average wages nationwide. However, the automatic adjustment has not worked as Congress intended, because the wages of the highest paid workers have increased much more rapidly than the average over the last several decades. As a result, the increase in the maximum taxable wage base has not kept pace with the rise in the salaries of the highest-paid workers. Consequently, the gap between the 90% target and the percentage actually covered has increasingly grown as more of the earnings of the highest paid workers has risen above the base. Numerous ways exist to generate revenue or savings of 1.95% of taxable payroll, the shortfall projected under the intermediate assumptions of the 2007 Trustees’ Report. One way would be to cut benefits, but that would be extremely unwise and unwarranted. Social Security benefit levels are modest in size;26 nevertheless, without those benefits, millions of Americans would, as detailed above, be living in poverty. Moreover, those benefits are being reduced under current law in the following two ways. The Social Security Amendments of 1983 provided that, starting in 2000, the normal retirement age under Social Security would gradually increase to age 67.27 While raising the normal retirement age sounds like a proposal aimed at keeping older Americans in the work force longer, it is indistinguishable from an across-the-board cut in retirement benefits. Social Security’s structure makes the two changes—an increase in the normal retirement age and a straightforward cut in benefits—essentially identical for retirees.28 Regardless of whether workers choose to start collecting Social Security benefits at the earliest age of eligibility, age 62, or at any later age, they still receive the same lifetime benefits, on average. The financial impact of increasing the retirement age is to provide a lower monthly retirement benefit at every single age than would be the case without the change—i.e., an across-the-board benefit cut. Raising the normal retirement age does not require anyone to work longer. Perhaps the changed age has a slight psychological effect, because it is labeled “normal,” but its main effect in causing people to work longer is that the reduced benefit levels make earlier retirement infeasible.29 Its impact on work effort is essentially no different than the impact a straightforward, across-the-board benefit cut would have. The increased retirement age, as a hidden across-the-board benefit cut, is best illustrated by its effect on the percentage of wages replaced by Social Security benefits. In 2000 (the first year that the older retirement age was starting to be phased in) Social Security replaced 55.5% of the wages of a low-income worker; in 2030, only 49.0% will be replaced; for a medium-income worker, 41.2% was replaced in 2000; in 2030, only 36.3% will be replaced; and for a worker earning at the maximum taxable wage base, in 2000, 27.3% of earnings was replaced; in 2030, the replacement rate will have fallen to 24.0%. Furthermore, the reduction of Social Security benefits should not be part of the solution to the projected deficit because of what is happening to the rest of the retirement income system. For the last few decades, private-sector defined-benefit plans increasingly have been terminated or frozen. Traditional defined-benefit plans now cover only about 20% of the private-sector workforce31 —and many of those plans are under-funded. While defined-contribution 401(k) plans have grown over those decades, accumulations in those plans are extremely low. In 2004, the median account balance for household heads aged 55-64 participating in a 401(k) plan was $60,000.32 Moreover, 401(k) plans often lack employer contributions, shift the risks of investment and longevity to the individual, are subject to the vagaries of individual investment experience, as well as high administrative costs, and are vulnerable to being cashed out before retirement. Additionally, American households now spend more than they save, resulting in a negative savings rate, the lowest since 1933.33 These trends only increase the importance of Social Security, and underscore the need, at the very minimum, to maintain that program’s benefit levels. In restoring Social Security to balance, we should not reduce the benefits of the one part of the retirement income system that is the most effective, most secure, fairest, most efficient, and widest in coverage. Solutions that alter the fundamental structure of Social Security should be avoided, as well. Today, some view Social Security as simply a government spending program, undifferentiated from other federal spending, and the deductions from wages that support the program as merely a tax, indistinguishable from other federal taxes. This conceptualization fails to recognize that Social Security is insurance. Joining together to share risk, exchanging the possibility of a larger loss for a smaller, certain payment, is the essence of insurance. A group of people, all of whom are exposed to the possibility of a particular loss, can protect against the loss by each contributing an amount of money related to the average likelihood of the loss’s occurrence. The arrangement eliminates the possibility of a large, unsustainable loss by any member of the group. Each member of the group trades a larger possible loss for a smaller but certain premium payment. This is the concept behind Social Security. Like other group insurance, Social Security involves making periodic payments and sharing the risk of loss—in the case of Social Security, loss of wages to support oneself and one’s dependents in the event of disability, death, or old age. Because the government is setting the rules, it can compel participation, which in turn creates a very broad risk pool. Compulsory participation reduces costs to participants, because of the savings of economies of scale, the elimination of adverse selection, and, most importantly, the absence of certain expenses like advertising and selling, which can be very large for private insurance companies. Thus, Social Security is extremely cost efficient, returning in old age, survivors and disability benefits, more than 99 cents of every dollar collected. Consistent with the program’s distinctive insurance character, the legal structure of Social Security is one of direct exchange. A worker must be insured under Social Security to be eligible for benefits. Insured status is achieved by having the requisite number of quarters of coverage, which requires a specified level of earnings, on which contributions are paid.34 The contributions are placed in trust and held for the sole purpose of paying Social Security benefits and expenses. The surplus of Social Security’s income over the program’s outgo is, by law, invested in Treasury bonds at fair market interest rates that are carefully accounted for and fully repaid with interest. Those employee contributions are today commonly referred to as a payroll tax, but that is a misnomer in two respects. First, workers do not have payrolls, only employers do. More importantly, the deductions from wages are better understood as mandatory premiums or contributions, rather than ordinary taxes. It is instructive to note that the acronym for the Social Security payment is FICA, which stands for Federal Insurance Contributions Act, enacted in 1939, well before the days of paid political public relations consultants and spin doctors. When understood as an insurance program, the financing makes sense. Social Security’s benefits are related to earnings on which FICA deductions are made. The employee earning just at the maximum taxable wage base, $97,500 in 2007, and the employee earning 10 times that amount, each receive the same Social Security benefits. Consequently, it is rational that they purchase these benefits for the same dollar amount, even though the dollar amount translates to a different percentage of earnings, just as they pay for private insurance, food, cars, or any other economic good or service based on cost, not ability to pay. The insurance design of Social Security is important to the accomplishment of the program’s goals. Social Security, as its name suggests, is intended to provide not only tangible cash benefits, but also the intangible benefit of peace of mind. For Social Security to accomplish its goal of providing security, people must be able to depend on its long-term continuation. Otherwise, the program ceases to function as intended; it provides income replacement only, not true security. No Congress can bind its successor to maintain statutory entitlements. Nevertheless, to the extent that people have made specific monetary payments to ensure receipt of their own benefit, the moral obligation of government to honor the promises made is much stronger than it otherwise would be. Americans appropriately have a sense of contributing toward their own retirement and feel good about receiving those benefits. The benefits are not based on need, but rather have been earned through labor and concomitant contributions. To maintain the security of the program, reformers should avoid making changes that reduce Social Security’s deficit by altering the fundamental structure of the program in a way that weakens or eliminates the link between contributions and benefits. Some propose, for example, lifting or eliminating the maximum taxable wage base for assessing contributions but not for calculating benefits. Breaking the connection between benefits and contributions, by raising or eliminating the maximum taxable wage base for contributions but not for benefits, alters a basic feature of Social Security that has been a part of the program from its creation. A core principle of Social Security is that the higher your covered earnings, the larger your benefit. If policy makers are concerned that the wealthiest Americans shoulder more of the cost of Social Security, they should consider financing some of its cost through a progressive tax, such as the federal estate tax or the income tax. If they are concerned that high-income individuals shoulder their fair share of the federal tax burden, then corrective measures should be taken—not by altering Social Security’s basic design, but by improving the progressivity of federal taxes as a whole, so that those who have the greatest amount of discretionary income pay the greatest amount of taxes, in both absolute and proportionate terms. Similarly, proposals to exempt low-income workers from contributing to Social Security, while requiring other workers to do so, are well-meaning but misguided. They too change a basic attribute of Social Security, a design feature in the program from its inception, and they inadvertently weaken the insurance nature of the program. Those exempted workers would be perceived as getting Social Security for free. Social Security benefits vary with past earnings and years of work. If two low-income retired workers, with identical assets, had paid nothing for their benefits, it would be hard to justify providing them with different benefits simply because one had more years in the workforce and had received slightly higher wages. More generally, it would be difficult to justify paying some low-income workers more generous Social Security benefits, which are not subject to a means-test, and other individuals means-tested SSI benefits. Retaining the fundamental design features, that all covered workers contribute to Social Security and that the amount contributed relates to benefits earned, is important to the stability, popularity, and success of the program. Recognizing that low-income workers were burdened—not just by contributions to Social Security, but also by federal and state income taxes, other work expenses, and, to the extent that employer taxes are borne by workers, by employer payments for unemployment compensation, workers’ compensation, and Social Security—Congress enacted the Earned Income Tax Credit (EITC) in 1975, and has expanded it several times since then (most recently in 2001). The EITC provides eligible low-income taxpayers a refundable tax credit to be applied against their income tax liability. Sometimes viewed as an alternative to exempting the working poor from FICA, the EITC offers several practical advantages in addition to retaining the essential link between Social Security contributions and benefits. In contrast to an exemption from FICA, the EITC is refundable, larger in amount, and takes into account family income and family size. The EITC indirectly adds progressivity to Social Security without undermining the program’s basic structure and philosophy. An additional opportunity to increase the program’s progressivity without undermining its basic structure and philosophy is presented, paradoxically, by the current projected long-range deficit. Given that Social Security’s trust fund reserves will continue to increase for the next 20 years as a result of the program’s continuing surplus income over outgo,36 and given the uncertainty of projections farther into the future, it makes no sense, without strong policy justifications independent of the projected deficit, to change Social Security. Fortunately, Social Security can be brought into close actuarial balance37 over the next 75 years with three reforms,38 each of which is sound policy in and of themselves. All three would deserve enactment, even without their beneficial effect on Social Security’s finances. The three proposals retain Social Security’s distinctive character, increase Social Security’s progressivity, maintain benefit levels, have no effect on 94% of workers, and increase the cost of the highest paid 6% of workers by an extremely modest amount. For all these reasons, this set of reforms, whose description follows, can properly be called the ideal, pain-free (for almost everyone) plan to strengthen Social Security. First, the practice of assessing Social Security contributions on 90% of all covered earnings nationwide should be restored. As described above, the 90% target has increasingly been missed over the last two decades, not because of any conscious policy decision but simply because the wages of the highest paid workers have grown much faster than the average, causing an increasing amount of the earnings of the highest paid to escape taxation. The 90% target can be reached by raising the maximum taxable wage base above the increases automatically scheduled in the law. The restoration should be done extremely gradually—over a number of decades—so that the impact would be modest on the 6% of workers who, because they earn above the maximum taxable wage base, would be affected by the reform. Specifically, on top of the annual percentage increase in the maximum taxable wage base to match the growth in average wages, this proposal would impose an additional 2% increase in the base, until the base once again covers 90% of all wages paid to covered workers. For example, in 2007, the maximum taxable wage base is $97,500. If the reform had been in effect this year, the base would have been $1,884 higher (i.e., 2% of the 2006 base of $94,200) than it would have been with only the automatic increase of $3,300. That is, under this proposal, the 2007 base would have been $99,384 (i.e., the 2006 base of $94,200 plus the automatic increase of $3,300 plus the 2% addition of $1,884), and the additional tax paid by the 6% of workers earning above $97,500 in 2007 would have been $116.81 (i.e., 6.2% of $1,884). Those workers and their families would get slightly higher benefits in the event of death, disability, or old age.39 The 94% of workers earning under the maximum taxable wage base would be unaffected. In practice, this reform would mean that deductions from earnings for the highest-paid 6% of workers would simply continue, at most, for one additional week into the year. Social Security contributions are generally withheld at equal rates of 6.2% from workers’ paychecks unless and until wages reach the level of the maximum taxable base. Those earning $97,500 or below in 2007 generally have Social Security contributions withheld from every paycheck all year long. In contrast, those earning above the maximum taxable wage base, have Social Security contributions withheld on the first $97,500 in 2007; once that amount has been earned, Social Security withholding stops for the year and net take-home pay increases through the end of the year. Those earning just above the maximum taxable wage base would have Social Security contributions withheld for one week longer than they would experience without the change. Those earning well over the wage base would reach the 2% increase in less than a week. The 94% of workers earning under the maximum taxable wage base would experience no change at all; they would continue to have Social Security contributions withheld for the entire year, as they do under current law. Although the timetable could be sped up in order to reach the 90% level sooner, this would impose a large new expense on workers who earn not much above the present maximum, without a commensurately large reduction in the deficit. That is, returning to the 90% level very gradually, in about 36 years, by imposing an additional he 2% annual increase, over and above the automatic adjustment to the base, is projected to reduce the projected deficit by 0.7% of taxable payroll. Restoring the 90% level in 10 years, instead of 36, would require adding 8% rather than 2% per year to the automatic adjustment. The speedier restoration would have cost a worker earning, for example, $105,100 in 2007 an additional $467.23 (as opposed to $116.81), but reduces Social Security’s projected long-range deficit by only an additional 0.13% of taxable payroll. The slower timetable accomplishes nearly as much deficit reduction without sharply increasing the burden of any individual worker. Instead of repealing the estate tax, maintaining it at its 2009 level and earmarking its proceeds for Social Security would provide a progressive way of paying down a portion of the costs incurred at the inception of the program. During the start up of Social Security, policy makers decided that the then-current generation of retirees should receive a meaningful benefit from Social Security, even though they did not have enough years under the system to contribute anywhere close to the equivalent value of those benefits. Providing meaningful benefits to older workers at the plan’s start is analogous to the practice of many private pensions, which grandfather in older employees by start-up granting them past service credits. Social Security’s startup costs have never been amortized.41 Rather than being met solely by the contributions of future workers and their employers, this legacy debt should be paid, at least in part, from a progressive tax, since all of society benefited. Independent of whether the estate tax is dedicated to Social Security, it should be preserved as a matter of principle. The federal estate tax is the nation’s most progressive tax. As it will be structured in 2009, the estates of the top 5% of all Americans will pay 99.6% of the tax; the top 1% will pay 97.4% of the tax.42 More fundamentally, inherited wealth undercuts the democratic ideal of a meritocracy; imposition of a tax upon the transfer of huge estates from one generation to another is consistent with basic democratic principles, as was recognized by, among others, Thomas Paine, one of the leading intellectuals behind the American Revolution and an advocate of an inheritance tax. An estate tax implicitly recognizes that it is impossible to build a sizeable estate solely on one’s own efforts. The accumulation of large estates always depends on the general productivity of the American economy and its infrastructure, including transportation, security, and communications. Large estates depend on the contributions of others, including those who came before. Thus, requiring the very wealthiest Americans to contribute a portion of their fortune, on a one-time basis, only after death, to the common good, while still transferring more than half of their assets to heirs43 seems a reasonable minimum to ask of those who have benefited so greatly from the commonwealth (i.e., the common wealth). Since the estate tax is set to revert to pre-2001 levels in 2011, setting the exemption level at $3.5 million per individual would entail a cost to the federal government relative to current law. However, this change would obviously raise more revenue than a full elimination of the tax as many conservatives advocate; retaining the estate tax would thus lead to smaller unified deficits than under a full-repeal option. Given the expiration of the Bush tax changes in 2011 and the enormous expense of extending them, policy makers will have to confront a broad array of tax choices—including the estate tax—with an eye toward limiting deficits. Retaining the estate tax as part of a more comprehensive reform and dedicating the revenue to Social Security both is good tax policy and would improve the finances of the trust fund. As with the restoration of the maximum taxable wage base, this reform would have no effect on the vast majority of taxpayers. Finally, just as virtually every other pension plan, Social Security should be permitted to diversify its portfolio and invest in stock funds, as well as Treasury bonds. (Social Security is restricted by current law to investment in United States’ obligations or in entities whose principal and interest are guaranteed by the United States.) In proposing individual accounts, President Bush sought to capture the historically higher returns from investment in equities. The proposal in this paper permits Social Security to capture those same returns. However, the impact of the two proposals is dramatically different. Under President Bush’s private accounts proposal, beneficiaries bear all the risk; in marked contrast, when Social Security does the investing directly, beneficiaries bear virtually no risk. Under the proposal outlined here, each individual’s retirement income would continue to be based on wages, not on the vagaries of the stock market. Unlike investments by individuals, investment by Social Security spreads the risk across the entire population over an unlimited time horizon. This is very different from President Bush’s proposal. Under his proposal, each individual investing retirement funds in the stock market through an individual account bears the entire risk of poor investment performance. In addition, individual investors ordinarily will have to cash in their investments at or near the time of retirement, and if they are to protect themselves from running out of money before they die, they will need to purchase annuities. They may be forced to sell stocks and buy an annuity during a market downturn. An adequately funded Social Security program, in contrast, would rarely—if ever—have to reduce net assets at any particular time and so could ride out market fluctuations. Investment risks would be spread over the entire population and be independent of the time a worker filed for benefits. Diversifying Social Security’s portfolio would permit the benefit of higher market returns with virtually no individual risk—including the risks of poor choices, bad luck, or inescapable poor timing. Social Security would continue to guarantee identical benefits, as a matter of right, for identically situated workers. The proposal to permit Social Security investment in equities was first mentioned in the 1930s, but was not pursued because conservatives at the time were concerned about government interference in the stock market.45 Many of today’s conservatives embrace President Bush’s proposal for Social Security private accounts, which suggests that the historical concern should no longer be there if proponents of private accounts are to be consistent. Under both the president’s proposal and the one advocated here, the government selects a limited number of stock funds in which the monies could be invested. Government involvement in the stock market is no different in practical effect if individual workers decide what percentage of Social Security contributions go to each fund, as under the president’s proposal, or if an independent board of experts makes the same decision, as would be the case if the assets remained pooled. There is ample precedent for responsible investment in equities by today’s public pension plans. Assets of the Railroad Retirement Plan, the Federal Reserve Board Plan, the Tennessee Valley Authority Plan, many state plans, and Canada’s Social Security pension plan are invested in equities. In all of these cases, the government recognized that higher market returns could be realized without government interference in the stock market, simultaneous with achieving the paramount goal of advancing the economic security of workers and their families. 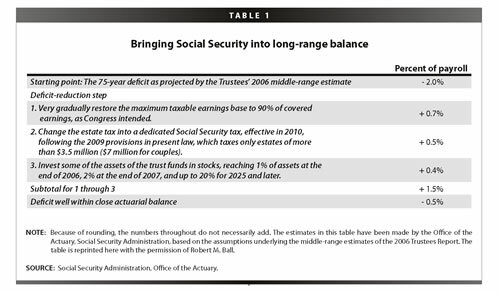 Taken together, these three proposals put Social Security into close actuarial balance over the next 75-year valuation period, as Table 1 shows. All three of these proposals are desirable in and of themselves, in addition to their importance in bringing Social Security into balance. Because of productivity increases greater than currently assumed or other favorable changes in the economic or demographic assumptions, the Trustees’ middle-range estimates may prove to be too pessimistic and actual experience may be closer to the low-cost estimates, making additional reforms unnecessary. Nevertheless, one final set of changes should be made to ensure Social Security’s long-range financial health. It is important to recognize that the 75-year valuation period is not static; each new valuation period replaces the current year with a more expensive out-year, three-quarters of a century away. Each annual Trustees’ report, with a new 75-year valuation period, permits the nation to have a long time to absorb new demographic and economic trends. The length of the valuation period and the likely inaccuracy of projections that far into the future argue that close actuarial balance should be sufficient for the present. In contrast, the president, as well as many other conservatives—people who appear to be ideological opponents of social insurance and, whose positions, therefore, may be disingenuous efforts to undermine Social Security—have argued, that not only is a 75-year valuation period insufficient, but that the actuaries should employ an infinite time horizon for making projections. This seems absurd on its face. Does it make sense to set policy, and perhaps cut benefits today, based on the assumption that in the year 2200, everyone will be living to 120, but the normal retirement age will remain unchanged at 67? Nevertheless, it does seem prudent to anticipate the possibility of continually lengthening longevity beyond the next 75 years, which, if it were to materialize, could cause substantial deficits in future valuation periods. Thus, even once the baby boom population has died, the population may remain an aged one, if future generations live longer than today’s elderly. The Social Security Amendments of 1983 changed Social Security’s financing, so that its accumulated reserves would not be simply contingent in the event of short-term deficits, but rather more substantial to produce significant supplementary income for the program. Given the projections that the shift in demographics to a more aged population will be a permanent one, it would not be prudent long-run policy intentionally to draw down the reserves of Social Security over the next 75 years. If that were done and the purpose of the reserves was once again only for a short-term contingency, then in the 76th year, the program might face a substantial deficit. In the event of such a deficit, Congress would have to increase contribution rates substantially under the intermediate assumptions—from today’s 12.4% of payroll to an estimated 17.8% in 2080 and even higher after that. Building and maintaining the reserve, therefore, should be an essential part of strengthening the system, so that earnings on the fund reserves continue to contribute to future financial stability beyond the retirement of the baby boom generation and beyond the current 75-year estimating period. It is likely that the three prior proposals might on their own result in a reserve that never declines. Small variations from the official projections with respect to immigration, fertility, or productivity, for example, could cause continued surplus. Nevertheless, in order to prevent a future steady decline in the trust funds, a contingent contribution rate increase could be enacted.46 For example, legislation could be structured to provide that, if after the adoption of the three reforms enumerated above, the Trustees were nevertheless at any time to project that the trust funds were to decline within the subsequent five-year period, a contingent tax rate increase would go into effect automatically in an amount necessary to prevent such a decline. That would ensure that the plan for partial reserve financing, put in place in 1983, would be preserved and would prevent the sale of the Trust Fund’s accumulated principal. This tax would be contingent only, and the hope is that it would never be activated. Just as it is important to avoid under-funding Social Security, over-funding it should be avoided as well. Rather than adding to security, over-financing of Social Security has the detrimental effects of either having benefits lower than necessary or taxes higher. Over-funding imposes excessive costs on the current generation of workers when, as history indicates, future workers are likely to have greater productivity and higher standards of living and, thus, will more easily be able to bear the costs. A contingent tax rate increase, together with the other specified reforms, should keep Social Security paying full benefits on time, without building either an excessive and unnecessarily large trust fund balance, or an inadequate one, which might require Social Security to adopt, on short notice, an overly high tax rate. It has the final advantage of preventing future ideological opponents of Social Security from using projected deficits, well in the future, as a cynical device to undermine the confidence of current and future beneficiaries in the soundness of Social Security. The nation’s current patchwork retirement income system is in many ways a historical accident—certainly not a carefully thought-through, rational policy response to the quest for secure, fair, and adequate retirement income for our nation’s workers. Unlike Europe, which enacted social insurance soon after the start of the industrial revolution, the United States waited until 1935—more than a half century after the creation of the first employer-provided pension. By that time, private pensions were a small but established part of the economic landscape. Taking them into account, policy makers crafted Social Security not to replace private pensions, but simply to be a floor of protection. Then, just six years later, the United States entered World War II. During the war, wages were controlled, but deferred wages were exempt from those controls. Consequently, private pensions became one of the very few ways to compete for labor at a time when it was in short supply. During this same period, Congress failed to raise Social Security benefit levels and, consequently, they eroded substantially. Experts at the time recognized that the minimal Social Security benefits, even coupled with private pension coverage, would result in inadequate retirement income for most Americans, and would have to be supplemented by individual savings and investment. In 1949, one of those experts, Reinhard A. Hohaus, vice president and chief actuary of the Metropolitan Life Insurance Company, used the analogy of a three-legged stool to describe the patchwork system, and the image caught on. The three-legged stool metaphor exemplifies Cardozo’s concern. When the mind’s eye pictures a three-legged stool, it automatically conjures one with three equal legs. But the three sources of income are inherently unequal. Private pensions, unsurprisingly, have never worked as well as Social Security in achieving public goals. Historically, employers created these voluntary arrangements for their own business and personal reasons—to tie employees to them, to provide for the top executives, and so on. It was only in the 1930s, as the federal income tax was dramatically expanded and as enterprising insurance brokers marketed private pensions as tax loopholes, that the government began to play catch up with these arrangements, seeking to ensure that some of their benefits went to low- and moderate-income workers. Private pensions, at their height, never covered more than about half the workforce, and they are intrinsically insecure. Nor are private savings an equal leg, notwithstanding the metaphor. Low- and moderate-income families that can barely meet current expenses lack the discretionary income—even with the incentive of a tax subsidy—to build a significant portfolio of stocks and bonds to be drawn upon only at retirement. History shows us that. Prior to the creation of social insurance by German Chancellor Otto von Bismarck at the end of the 19th century, a number of European nations sought to induce increased private savings as a way of dealing with economic insecurity brought about by industrialization and urbanization. In 1850, for example, France established the National Old Age Insurance Institution, a voluntary program where benefits were directly related to contributions. Not even workers making average wages took part. To the extent the program was used at all, it was almost exclusively the wealthiest workers who took advantage of it. Inducing retirement savings through tax incentives is much less efficient and effective than simply providing benefits directly. Inducing behavior through the use of the federal income tax code is a poorly targeted approach, providing tax breaks for behavior that would have occurred without the incentive and failing to get benefits where they are most needed. Moreover, trying to induce the proper behavior requires substantial regulation and enforcement. The current system of private pensions includes substantial government intervention. This governmental presence includes (1) an annual tax subsidy for private plans of over $110 billion a year,47 the largest in the income tax code,48 (2) the Employee Benefits Security Administration at the Department of Labor with its reporting and disclosure requirements, enforcement responsibilities, and reams of regulations, (3) the Employee Benefits Plans Office at the Internal Revenue Service with its cumbersome nondiscrimination rules and other complicated reams of regulations, and (4) the Pension Benefit Guaranty Corporation with its 2006 deficit of $18.8 billion and its projected exposure of $73 billion as a result of “new probable terminations.”49 Despite all of this government involvement, employer-sponsored plans have never covered more than about half the workforce and the benefits of private-sector plans go disproportionately to top executives and other highly compensated employees. Moreover, the courts are constantly clogged with lengthy, expensive litigation involving these plans. Further, the administrative costs, in many cases, are extremely high. Within the last year, for example, 10 class action lawsuits have been filed against major corporations, challenging, as excessive, the fee structure that is used by most 401(k) plans in the country. Notwithstanding our mental image of a stool with three equal legs, the Social Security leg is vastly sturdier and better built than the other two. Social Security is fully portable. It covers virtually the entire work force, including those most difficult to reach, such as part-time, seasonal, and household employees. The program is fairer to those with less discretionary income: as described earlier in this paper, it has a progressive benefit formula, which provides larger proportionate benefits (though smaller in dollar amount) to low-income workers, part-time workers, and those with gaps in their working record due to unemployment, time caring for family members, or other reasons. Its benefits are fully backed by the federal government, which, unlike private employers, can raise taxes and will never go out of business. Social Security spreads risk much more widely. And Social Security has much lower administrative costs than the other two legs. The three-legged stool metaphor, with the mind’s eye picturing three equal legs, channels thinking towards the necessity of strengthening and reinforcing each leg—after all, how else is the stool to remain upright? But of course, the goal is not to stabilize a stool. To help us untangle the retirement security challenge, it is helpful to clear one’s mind completely of the image of a three-legged stool. When one returns to first principles, and thinks about the problem with fresh eyes, free from the metaphor’s stifling grip, the solution becomes clear. The nation’s goal, since the enactment of Social Security, has been to permit every American worker to retire with a secure source of income that adequately replaces pre-retirement wages. Social Security meets the goal perfectly, except that its benefits are inadequate. Once Social Security is projected to be in long-range balance, policy makers should increase its benefits in a prudent, careful manner. Raising Social Security’s benefits is the fairest, simplest, most secure, most effective, and most efficient way to ensure that all Americans can enjoy a secure and adequate retirement following a lifetime of labor. —Nancy Altman is a lawyer with more than 30 years of experience in the areas of Social Security and private pensions. She was Alan Greenspan’s assistant in his position as chairman of the 1983 bipartisan commission on Social Security, and she has taught courses on retirement income at Harvard Law School. She is the author of The Battle for Social Security: From FDR’s Vision to Bush’s Gamble (John Wiley & Sons 2005). —Some parts of this paper also appear in Nancy J. Altman, The Battle for Social Security: From FDR’s Vision to Bush’s Gamble (John Wiley & Sons 2005), and in Altman, “Social Security and the Low Income Taxpayer, American University Law Review, Vol. 56, No. 5, pp. 1139-61 (June 2007). Throughout this paper, “Social Security” refers to the cash benefit programs, Old Age, Survivors, and Disability Insurance (OASDI), not to Medicare. All figures not specifically noted come from the Social Security Administration. The opinions expressed here, as well as any errors, are those of the author alone. 2. In December 2005, nearly 10.1 million people aged 18–64 received disability benefits. Of those, 6 million, or nearly 60%, received Social Security disability insurance benefits only, 2.9 million, or 29% (2.9, received benefits from the Supplemental Security Income program (SSI) only, and 1.2 million, or 12%, received benefits from both programs. In August 2007, the average monthly benefit disabled workers received was $979.10; in contrast, the average monthly SSI benefit for recipients aged 18 to 64 was $482.30. 3. Abraham Epstein, Facing Old Age: A Study of Old Age Dependency in the United States and Old Age Pensions, pp. 20-21 (Mew York: Alfred A. Knopf 1922) (quoting L.W. Squier, Old Age Dependency in the United States pp. 28-29 (New York: Macmillan, 1912)). 4. Id. at 4 (quoting E.T. Devine, Misery and Its Causes, p.125 (New York: Macmillan 1909)). 5. Committee on Economic Security, Social Security Administration, U.S. Social Security in America, Part 2, Chapter 7, p. 138 (1937). http://www.ssa.gov/history/reports/ces/cesbookc7.html. 6. When Social Security became law, every state but New Mexico had poorhouses, which were also referred to as almshouses or poor farms. The proximate cause ending the system of poorhouses was the program of Grants to States for Old Age Assistance, which was enacted in the same legislation as Social Security. Social Security today prevents millions of elderly Americans from falling into poverty, but was not the main contributor to ending the poorhouses, because it was structured to be slow to develop, requiring that workers achieve insured status in order to receive benefits. 9. Arloc Sherman and Isaac Shapiro, Social Security Lifts 13 Million Seniors Above the Poverty Line, Center for Budget and Policy Priorities (2005). 11. Dale Russakoff, Human Toll of a Pension Default, Washington Post, June 13, 2005. 12. “Present value” is the value today of all future payments, discounted by a rate of return in order to reflect the time value of money. For example, the present value of a $1,000 benefit check paid in one year is $946, using a rate of return of 5.7% ($946 x 1.057 = $1,000). 13. The 16-to-1 ratio is a meaningless and misleading factoid, plucked from 1950, a year when Social Security was expanded to cover millions of new workers. The ratio never influenced policy in the slightest. It is the kind of ratio experienced by all pension plans, public and private, at the start when few workers have yet qualified for benefits. By 1960, the ratio was 7-to-1; by 1975, the ratio was 3-to-1 where it has remained. In June 2005, 158.7 million workers contributed to Social Security and 48 million people received benefits, for a ratio of approximately 100 workers for 30 beneficiaries, or 3-to-1. Social Security’s actuaries estimate that, in 2030, there will be 46 beneficiaries for every 100 covered workers, and in 2050, 50 beneficiaries for every 100 covered workers, for a worker to beneficiary ratio of 2-to-1. In contrast to the 16-to-1 ratio, the shift in ratios from 3-to-1 to 2-to-1 is meaningful, though the shift does not provide a great deal of insight about affordability, as discussed in the text. 14. The worker-to-beneficiary ratio does not reveal much about burdens imposed on workers from support of all dependents, just of those receiving Social Security benefits. A better, but still limited, measure of the economy’s ability to support non-workers is the total dependency ratio, which is the sum of those under age 20 plus those age 65 and over divided by those aged 20 to 64. As with the worker-to-beneficiary ratio, the greater the number of workers in relation to dependents, the larger the number of people upon whom the costs of support can be spread. The fewest number of workers in relation to dependents occurred in 1965, when there were a total of 95 children and elderly, combined, for every 100 adults of working age. That high number of dependents in relation to workers has declined substantially since 1965, and is not projected to reach that level again. Currently, there are approximately 67 dependents for every 100 workers; the actuaries estimate that there will be approximately 79 dependents for every 100 workers in 2030; and in 2050, approximately 81 dependents for every 100 people of working age. Moreover, the composition of the dependency ratio has changed: there are now more elderly and fewer children in the mix. Because few children can support themselves, but many seniors can and do, the change in the composition means that programs of income support—e.g., Social Security—are more easily affordable than if the mix were otherwise. The focus of this paper is on income support. Of course, the change in the composition of the dependency ratio has different impacts on programs like health care and education. One shortcoming of the total dependency ratio, in addition to ignoring productivity, is that it only looks at age, not work status. Though still imperfect, a measure without some of the flaws of either the worker to beneficiary ratio or the total dependency ratio is the consumer to worker ratio, which reflects the total number of people consuming goods in relation to the actual number of workers. Like the total dependency ratio, this ratio was also highest when members of the baby boom were children. In 1960, for example, every 100 workers supported 268 consumers (including themselves). By 2000, the ratio had fallen substantially, with 100 workers supporting only 201 consumers. 15. Social Security is financed from three major sources: (1) contributions from wages (matched by employers), (2) interest earned on Trust Fund investments in government securities, and (3) dedicated income from the inclusion of a portion of Social Security benefits in taxable income for federal income tax purposes. 16. See endnote 14 for a discussion of dependency ratios that are more informative than the very crude worker-to-Social Security beneficiary ratio. 17. The Century Foundation, Social Security Reform, p. 27 (2005), available at http://www.tcf.org/Publications/Retirement Security/SocialSecurityBasicsRev2005.pdf. The United States currently spends 4.25% of GDP on Social Security. 18. To ensure Social Security’s long-term financial security by providing an early warning system for problems that may occur in the future, the program’s Office of the Actuary makes projections every year of anticipated revenues and expenditures over a 75-year valuation period. These projections are published in the Board of Trustees’ annual report. Seventy-five years is the valuation period that the actuaries have used consistently since 1965. (From 1950 through 1955, the valuation period used was 40 years. In the 1950 and 1954 reports, more than three estimates were made with none specified as most likely; some showed actuarial balance over the full valuation period and some did not. The 1956 and 1957 reports used 35 year valuation periods; the 1958 report used 80 years; the 1959 report, 60 years, and from 1960 through 1964, 55 years. From 1965, a 75-year valuation period was used, though the Social Security Amendments of 1977 left the trust funds in balance only through the first 50 of those years.) Three-quarters of a century is longer than any private pension plan uses. Indeed, the lengthy valuation period is longer than those used by most other countries in the world. Nevertheless, Social Security’s Trustees have concluded that for this nation’s program, where changes must traverse the legislative process, 75 years is the proper length of time to forecast the long-term financial operations of the trust funds. The valuation period covers the time when workers first join the workforce, around age 20, to the approximate end of their retirement years, at age 95. In developing the projections, the actuaries make dozens of assumptions about a variety of demographic factors, such as fertility rates, mortality rates, immigration rates, and work force participation rates of women, as well as a variety of economic factors, such as productivity rates, inflation rates, interest rates, and wage levels, for each of the 75 years. Each year, the actuaries produce three separate projections, an intermediate most-likely-case projection, a low-cost optimistic projection, and a high-cost pessimistic projection. The Office of the Actuary is a highly professional office; consequently, policy makers have appropriately deferred to its judgment concerning the proper valuation period and the various assumptions it adopts. 19. The legislation was based on a compromise agreed to by President Ronald Reagan and Speaker of the House Tip O’Neill, and worked out under cover of the so-called Greenspan commission. 20. For a general discussion of the actuaries’ projections, see endnote 18. 21. Report of the 1994-96 Advisory Council on Social Security, Volume I: Findings and Recommendations, Appendix 1, Developments Since 1983 (Washington, D.C., January 1997), available at http://www.ssa.gov/history/reports/adcouncil/report/append1.htm. 22. While each subsequent valuation period replaces a more expensive out-year with the less expensive current year (see discussion in this paper in the section, “Protect against draw-down of the reserves” beginning on page 12. ), these costs have been more than offset by favorable changes. Thus, the 2007 Trustees’ Report projects a long-range deficit of 1.95% of taxable payroll, while the 1997 report projected a deficit of 2.23% of taxable payroll. 23. Because the wages covered by the maximum taxable wage base had fallen to only 85% of total wages in 1977, Congress enacted several ad hoc increases to the wage base so that it would once again cover 90% of all wages, explaining its reasoning in the accompanying Committee Report of the Ways and Means Committee, as follows: “Your committee’s bill provides for increasing the contribution and benefit base...to a level where about 90% of all payroll in covered employment would be taxable for social security purposes...Your committee believes that it would be desirable to move toward taxing a higher proportion of total payroll in covered employment than the 855% that is now taxable.” In 1983, Congress implicitly endorsed the 90% mark by taking no contrary action. 24. Under the low-cost, optimistic assumptions, Social Security is projected to have a long-range surplus, over the 75-year valuation period, of 0.36% of taxable payroll. Under the high-cost, pessimistic assumptions, the long-range projected shortfall is 5.05% of taxable payroll. Historically, the projected income, outgo, deficits, surpluses, and the estimated cost or savings of proposed changes have been expressed in terms of percentage of taxable payroll, because the dollar amounts would be too unwieldy to work with. It is analogous to astronomers using light-years, rather than miles or kilometers. In formulating policy, policy makers traditionally rely on the intermediate, most-likely-case projections. 25. Chad Stone and Robert Greenstein, What the 2007 Trustees’ Report Shows about Social Security, Center for Budget and Policy Priorities (April 24, 2007), available at http://www.cbpp.org/4-24-07socsec.pdf. 26. The average monthly benefits for retirees in 2007 is $1,051; for aged widow(er)s, $1,012; disabled workers, $979; and surviving, care-giving spouses with two dependent children, $2,170. 27. For those born in 1938, the normal retirement age, for Social Security purposes, is 65 and two months. For each subsequent year of birth, the normal retirement age increases by two months, until it reaches age 66 for those born in 1943 year of birth. The normal retirement age stays at age 66 until the year of birth 1955, when it again increases two months for every subsequent birth year, until the normal retirement age of 67 is reached. 28. Social Security’s defined “normal retirement age” is significant only in calculating benefits for workers disabled prior to that age and for dependents of workers who die prior to that age, because those benefits are calculated as if the worker had reached normal retirement age. 29. Social Security, as described in the text, is actuarially neutral with respect to the age at which people decide to claim benefits. The larger impact on people’s decision whether to retire early is the role of the private sector. In addition to employers who offer “early-out” options for a limited time to older employees for the express purpose of encouraging older workers to retire, most plans offer subsidized early retirement. See Retirement: Early Retirement Incentives (Clark, Encyclopedia of Aging, 2002), available at http://www.agis.com/Document/345/retirement-early-retirement-incentives.aspx. Similarly, holders of Individual Retirement Accounts are able to withdraw funds without penalty, starting at age 59-and-a-half. At the same time, as health care costs continue to rise, employees who are not offered retiree health benefits may decide to continue to work until they become eligible for Medicare at age 65. 30. Net benefits will be even lower, because an increasing number of people will be required to pay income tax on benefits as a result of a 1983 provision that subjects taxpayers with higher earnings to count a portion of their Social Security benefits as taxable income. The provision did not index the earnings thresholds. As a result of that provision, that same median earner’s net replacement rate is projected to fall to 29%. Virginia Reno and Joni Lavery, Social Security and Retirement Income Adequacy,p.9 (NASI Issue Brief no. 25, May 2007), available at http://www.careerjournal.com/hrcenter/briefs/20070118-bna.html Moreover, these replacement rates do not take into account the cost of Part D premiums. 32. Alicia H. Munnell and Annika Sunden, 401(k) Plans are Still Coming Up Short, Issue Brief #43 (Center for Retirement Research at Boston College, March 2006), p. 5. 35. This result is produced mainly by means of a progressive benefit formula. Also, because the formula looks to career earnings, workers who have periods of unemployment receive larger proportionate benefits, as well. 36. The Bush administration has focused on, and the media has highlighted, the date on which outgo exceeds income from FICA, but that income is only one of three sources of Social Security’s revenue. Revenue from all sources is projected to continue to exceed outgo until sometime between 2025 and 2030. 37. First employed in 1957, “close actuarial balance” is a test that the trustees have used to determine the adequacy of Social Security’s financing. The trustees have long recognized the impossibility of making exact projections for as long as 75 years into the future. Close actuarial balance is met if income is within plus-or-minus 5% of outgo over the next 75 years, which today is calculated to be about 0.70% of taxable payroll. 2006 Annual Report at 61. 38. Former Commissioner Robert M. Ball developed the proposals discussed in this paper. 39. Because of the progressive benefit formula and the timing of receipts and disbursements, the proposal would generate income for the trust funds, despite the somewhat increased benefit levels. 41. From the beginning of the deliberations on Social Security, a number of experts have believed that, while the major part of Social Security’s financing should come from contributions from wages, some funding should eventually come from general revenue. 43. Spouses inherit without the imposition of any tax. 44. Thomas N. Bethell and Robert M. Ball, Straight Talk About Social Security, The Century Foundation, p.44 (1998) (citing research by Gary Burtless of Brookings Institution). 45. A number of safeguards could help ensure against interference with the stock market. First, the investments could be limited to very broad, indexed funds that reflect virtually the entire American economy, and not individual stocks. Further, the amount invested could be limited to, for example, no more than 20% of assets, not to exceed 15% of the total market value of all stocks. This amount could be gradually phased in to ensure against market dislocations. (The projected percentage of taxable payroll the presented in Table 1on page 11 indicates that this proposal generates is based on these limitations.) Further, a Federal Reserve-type board with long and staggered terms could be created and assigned the limited functions of selecting the indexed funds; selecting the portfolio managers by bid from among experienced managers of indexed funds; and monitoring and reporting to the trustees and public on Social Security’s investments. 46. In addition to the contingent rate increase outlined in the text, Congress might also consider that if the maximum taxable wage base had not yet been fully restored to the coverage of 90% of earnings, the timetable for restoration of the 90% base could be accelerated automatically. Second, if that alone were not sufficient to prevent the immediate decline in the trust fund ratio, the rate at which estates were taxed could increase automatically, up to a maximum of five percentage points. Further, Congress might also consider two other reforms—coverage of state and local employees not now covered and switching to the so-called chained-CPI. Both proposals are discussed in Altman, The Battle for Social Security: From FDR’s Vision to Bush’s Gamble (Wiley, 2005) pp. 306-7. 47. The present value of all tax expenditures with respect to employer plans was $186 billion in 2006. See OMB Analytical Perspectives, Budget of the United States Government, Fiscal Year 2008, Table 19-4. 48. CBO Testimony before the Committee on the Budget, U.S. House of Representatives, p. 10 (September 20, 2007), available at http://www.cbo.gov/ftpdocs/86xx/doc8642/09-20-Budgeting.pdf. 49. Pension Benefit Guaranty Corporation.